Ah, finally! Here's something I promised to make last year, but never got around to. It's a much loved Swedish cookie called Chokladbiskvi. 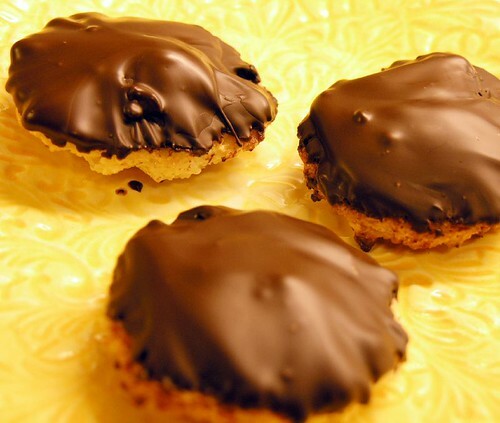 A biskvi is made from almonds and sugar, and filled with buttercream, then glazed with chocolate. 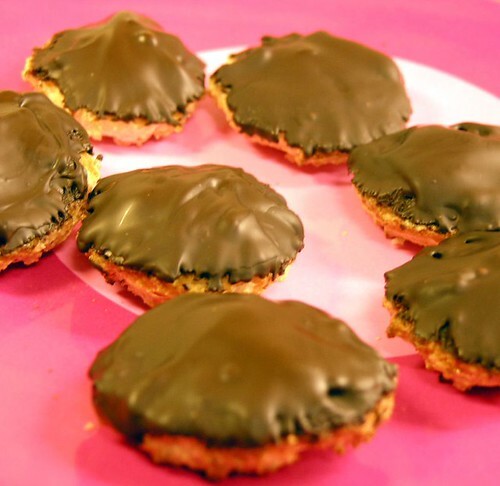 I've translated it into macaroons, because the cookie part and the filling part is indeed very similar, and I think that's the origin of this cookie. You can find it in pretty much every café in Sweden, but few people make their own. You can play with flavors, but this is the most popular kind. I've got one favorite besides this though - banana buttercream, and really bitter chocolate glaze. Yum! I might try making that at home sometime. I've only attempted this once before, using store-bought almond paste, but my neighbor had made homemade ones for her birthday party and once I had tasted those, there was no turning back. So, the kind neighbor not only gave me her recipe, but also let me borrow her almond grinder. Because that's something you do need here - grinding in a food processor won't give the same results. This is fairly fast and easy to make, and I find that the most challenging part is dipping the cookies in chocolate. Or to be honest, the toughest part is tempering the chocolate. If you're going to eat these quickly - and there's no reason you shouldn't - don't bother to temper the chocolate, and save yourself the trouble. I tried tempering, but probably didn't do it exactly right. They kept well over night but had started to show a little bit of blooming the next day. The store-bought biskvi typically has much more buttercream than mine does. If you want that, more of a pyramid shape, double the buttercream recipe. And do, DO, try them with coffee. It really is a match made in heaven. Could you make this with almond meal or flour? Paul - I've never seen either in stores here, but presumably almond meal would work. Flour would be too finely ground and not give the right chewy texture. Just made these cookies, and they are wonderful! They are just rich enough, a perfectly balanced cookie! A perfectly balanced cookie, that's just a little rich. Love your blog!! I make my buttercream like candy starting with a simple syrup cooked to the softball stage 230-234 degrees and then drizzling the syrup into raw egg yolks while they are beating in a mixing bowl. After that I add the butter and the cocoa. I found this recipe in an old Sunset cookie book and have been making it for close to 20 years. It is simply the best cookie ever. So funny...I was looking for a recipe I remembered from Karren M. and found this page. And here she is! This is simply the best cookie I've ever tasted.